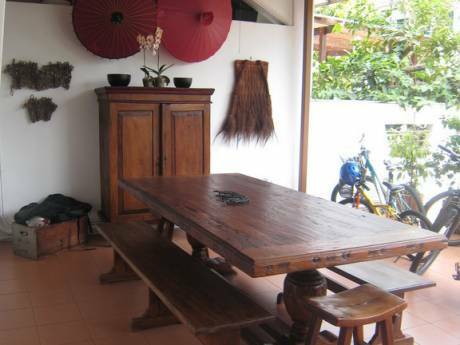 Our home is a bright and breezy two story house just minutes away from all of Singapores' major attractions. It has four bedrooms and a maid's room; a large master bedroom with ensuite, our daughter's bedroom has a single bed and we also have a separate bedroom for our baby boy with a crib, changing table and toys. All of the rooms have air conditioning. Downstairs has a very open flow between indoors and outside as the dining area opens to an outside conversation area and the lounge out to a small garden with tall trees. We have plasma tv with cable access to a wide range of international channels, stereo, and broadband internet access. 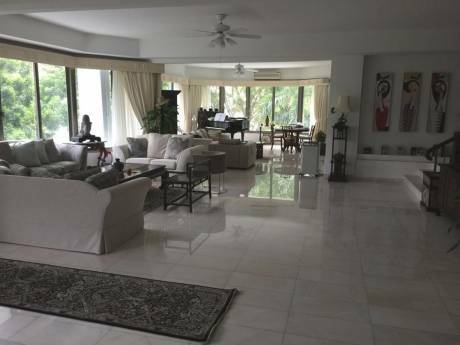 The kitchen is big and open with all of the appliances that you will need. We also have a great, unobtrusive, live-in childcare minder/maid. Sally can cater for all of your house keeping and cooking needs, and even baby-sit. In addition we have three indoor cats. The house is perfectly set up for a visiting family ot travelling professionals. We are Vanessa (37) and Mike (45) a married professional couple with a five year old daughter, Luiza and a sixteen month old baby boy, Meko. We are a true international family as Vanessa is Portuguese, Mike a New Zealander, and Luiza and Meko were born here in Singapore. We have been living in Singapore for nine years and have been fortunate to have traveled extensively and love finding new places to explore during our holidays. We have enjoyed three wonderful home exchanges, one in Spain and two in Australia. We love animals and have three cats of our own. We love to be near the ocean but also are open to any interesting travel opportunities. Our home is ideally located as a base to explore Singapore and beyond. 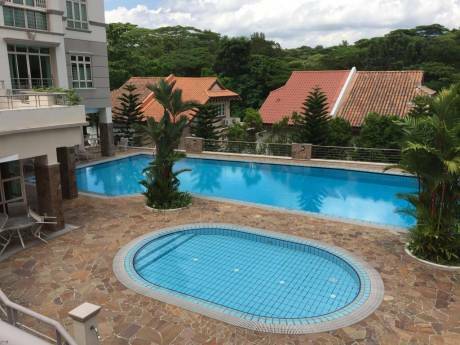 It is in a quiet residential area in the north east of the Island, which means that all the major attractions are less than a 15 minute taxi ride away (Orchard Road is about S$10 by taxi). A mini market store is within a 2 minute walk. It is also adjacent to a bus stop linking to the city wide public transport system. Due to the range of budget airlines Singapore is also an excellent base for shorter trips to explore other parts of Asia, such as Thailand, Bali and Malaysia.